Friendship’s great. Just remember that. Delcatty is a Stage 1 Colorless Pokemon, 90 HP, with a Fighting Weakness, no Resistance, and a Retreat Cost of 1. Her one attack Cat Kick is a 2-for-40 vanilla move, so it’s the least important part of the card. The Ability, Search for Friends, lets you add 2 Supporters in your discard pile to your hand when you evolve into Delcatty by playing it from your hand. Needless to say, Delcatty is the absolute best way of getting Supporters back from the discard pile, but is it worth running as a 1-1 line-up in most decks? Well that really depends more on the quality of the Supporters in your deck. Sure, grabbing Cynthia over and over again can be useful, but there are a lot of other Supporters that can be really good to have and use multiple times – Acerola and Guzma are just a couple of the more general side of that list, but Hala or Tate & Liza are also great options as well! Beyond that, it’s just a matter of figuring if you’ve got the room for Delcatty…and if you’re okay with having a big target on your Bench. At only 90 HP, Delcatty won’t really be able to do much after she’s put into play, and unless you’ve got a way of putting her back into your hand…without taking damage, she’s not going to have more than one usage of her Ability. Ideally that’s the one usage you need. But whether or not Delcatty’s a dud will depend entirely on how often she can get those 2 Supporters back and how much of an impact that has. Arora Notealus: Delcatty’s an interesting option to have available, but personally, I’m not entirely sold on using her. Sure, getting back 2 Supporters is powerful, and it’s a very welcome addition to any roster, but I don’t know if it’ll end up being an overwhelmingly powerful Ability or one that only a few decks which rely on specific Supporters could use. I imagine the latter to have Delcatty gravitate to them more than just the former, so we’ll have to see if she shows up in certain decks. Weekend Thought: Are some of these cards worth the hype? Should they have been on the Top 10? Think that maybe we’re selling them up for more than they’re worth? What decks would you use these cards in? Do you think these cards will have a big impact, bigger even than some of the Top 10 cards? We end the week with another runner up card: Delcatty (SM Celestial Storm 121/168). 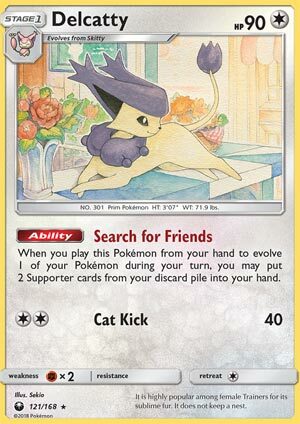 The rest of the card is underwhelming, being a Stage 1 Colorless type with 90 HP, weak to Fighting, a retreat cost of one, and an attack called Cat Kick which costs CC for 40 damage (or no damage if facing Necrozma-GX). The redeeming factor left for this card is its ability called Search for Friends. This is a one-time deal when you evolve your Skitty onto Delcatty from your hand. When you do, you put two Supporter cards from your discard pile onto your hand. On a Sun & Moon format, there is yet to have a card besides Delcatty that puts Supporters from the discard pile onto your hand. Pal Pad does recover Supporter cards, but it puts them back into your deck, and you cannot rely on drawing into any of the Supporter cards that you retrieved on your next turn. The biggest gripe would be if it’s really worth your deck space, bench slot, the risk that part of the evolutionary line are in the prize, and/or their Abilities could be shut down, just to get back two Supporter cards. For the format that we’re in and lacking other options that does a similar thing, it would be a resounding yes, and players would accommodate and assume the risk in return of a wonderful effect. And even if a Pokémon is just sitting there, it can help fuel up attacks that depend on how many Pokémon in play, like Empoleon’s Total Command and Zoroark-GX’s Trade attack. For the Expanded format, Delcatty would mostly be unneeded as there are older cards that can still do its job well from when it came out. The one card to compete and to triumph over is VS Seeker, an item card that takes a single deck slot as opposed to however many 1-1 Delcatty line you would try to insert with, and it puts one Supporter from the discard pile onto your hand. There! No risk of some components being prized, no need to worry about Ability lock, and no need to risk Pokémon giving up a prize card that just sits there after doing one thing. However, if you are dealing with item lock, and can’t get VS Seeker to work, then Delcatty serves as an out to such a hurdle. Even so, you might encounter a deck that can both shut down your items and abilities, such as a deck that contains both Garbodor’s Garbotoxin and Seismitoad-EX’s Quacking Punch. Delcatty is one of the possible prerelease Promos that you can pull from Sun & Moon Celestial Storm Prerelease Kit (or what would be considered Build & Battle). It also appeared in the Hydro Fury Theme Deck, which can be vital in recovering Supporter cards, if you can get it in play. Even after all that, Delcatty doesn’t have what it takes to be an attacker, as 40 damage hits too soft, even in a less hostile format. Conclusion: Delcatty is another option of getting back Supporter cards, which is vital to Standard, but redundant in Expanded unless you really want to keep retrieving Supporter cards. It’s another case of choosing which category of cards that you’re willing to use, and that’s between using an item or a Pokémon to do the same job. I used to think about dismissing this card, but Standard really needs this sort of card. Getting stuff back into your hand is better than being in your deck because you can actually get to use that card right away (assuming you haven’t played a Supporter for your turn). If you haven’t tried Delcatty yet, put it in a decklist tonight. I don’t think you’ll be disappointed. If you run a Pal Pad, take that out, and take out an Acro Bike or energy card. You can find two slots for this. I’m telling you, Delcatty is great, and I have used it quite a bit. I don’t track stats extremely closely in August, but when I did track them, I played Delcatty 5 times in 13 matches and won 4 of those 5 matches. It’s VS Seeker, it really does work the same way. When I have Skitty on my bench, I’m thinking about Ultra Balling for Delcatty or getting Rescue Stretcher so I can pull Delcatty out of the discard (I love Ultra Balling Delcatty away early in the game and using Stretcher to pull it out for a late Guzma). It’s the poor man’s Tapu Lele GX, but when you get two Supporter cards out of your discard and can play one of them right away, I’m telling you it feels just as good. All I’m saying is give it a try. Run it for ten or twelve games and see how many times you use it. One of the things that really bugs me is when people say, “Oh that’s awful it will never be good,” when they haven’t even done any play testing with it. Give it a shot, do your due diligence, and decide whether or not it’s worth the two slots – I definitely think it is. We close this week with what would have been our 15th place finisher, Delcatty (SM – Celestial Storm 121/168; SM – Black Star Promos SM132), at least if we’d started counting down SM – Celestial Storm from a high enough number. Delcatty only appeared on two individual Top 10 lists (neither of them mine), but this was enough to earn it 36 voting points. Delcatty is a [C] Type Stage 1 Pokémon with 90 HP, [F] Weakness, no Resistance, Retreat Cost [C], the Ability “Search for Friends” which adds two Supporters from your discard pile to your hand when you Evolve one of your Pokémon into Delcatty, and “Cat Kick” which costs [CC] and does 40 damage. Most of what I just listed is largely irrelevant; what matters is you have an easily KO’d Stage 1 with a potent Ability. Just running one will eat up two slots in your deck and a space on your Bench, and if your opponent goes for the easy Prize, that Bench space is vacated quickly and something more important might be spared. Something Search for Friends gets but that some other Supporter recycling tricks miss is immediacy: it isn’t just reclaiming a Supporter (or even Supporters), but getting them back in a manner that allows you to immediately use them (or another Supporter). So, did I goof? Maybe, but remember how I’ve been advocating for Magcargo, which is also an easily KO’d Stage 1 that eats up at least two slots in your deck and a space on your Bench. “Smooth Over” doesn’t recycle Supporters, but Pal Pad does, specifically shuffling two Supporters from your discard pile back into your deck. If your deck has something like Zoroark-GX or is simply running four Acro Bike, you’ve got a pretty solid combo to get one of those Supporters back this turn (and possibly getting the second Supporter back the next, if it is really needed). Now, you may be thinking “You’re comparing a single card to a combo: that’s apples-to-oranges!” and you’re right! This specifically hinges upon the idea you’re already running both the draw power and Magcargo you need, so that you only need to slip Pal Pad into your deck (which may also already be in your deck). The biggest reason for a deck to not run Magcargo is a lack of Bench space, which would also preclude those decks running Delcatty… and I’m already worried as more decks fall into this category than I expected. This is why I’m not expecting a lot from Delcatty… maybe enough that it should have made my Top 25, but definitely not enough for my actual Top 10. Not too bothered by it being this high in the runners-up, though. I haven’t mentioned Expanded yet because we already have VS Seeker. When it comes to the limited and Theme Formats, Delcatty is great! The risk you’ll have to play Delcatty prematurely when you don’t have any Supporters (or at least any you really wish to recycle) exists in Standard as well but was so low it wasn’t worth mentioning. In these Formats, it is just barely worth mentioning. You’ll find two copies of Delcatty in the “Hydro Fury” Theme Deck.